kt literary » Blog Archive » THE ENCELADUS CRISIS now in mass market paperback! 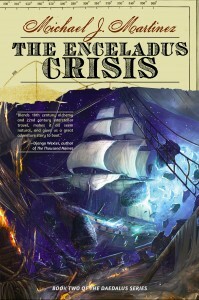 THE ENCELADUS CRISIS now in mass market paperback! The second book in Michael J. Martinez’s science fiction mash-up series is now available in mass market paperback!! THE ENCELADUS CRISIS picks up where Book #1, THE DAEDALUS INCIDENT, leaves off – with an adventure that spans worlds and rides sailing ships through space. Michael talks about this re-packagaing and release on his blog here! ← THE WEIGHT OF ZERO named to 2016 BEA YA Book Buzz List!